The charm measures about 1/2" tall. The link chain bracelet measures 7 1/2 inches and includes a 4mm genuine Austrian Swarovski crystal. 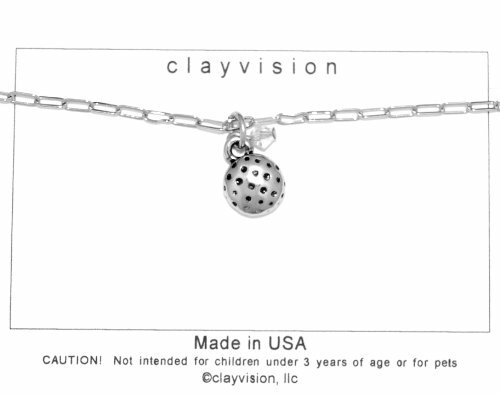 This item features an original Clayvision charm and one 4mm genuine Austrian Swarovski crystal. The link chain bracelet measures 7 1/2 inches long. This bracelet is available on Amazon.com in 14 different Swarovski crystal colored variations. Garnet Colored Crystal (January), Amethyst Colored Crystal (February), Aquamarine Colored Crystal (March), Clear Aurora Borealis Colored Crystal (April), Emerald Colored Crystal (May), Alexandrite Colored Crystal (June), Ruby Colored Crystal (July), Peridot Colored Crystal (August), Sapphire Colored Crystal (September), Rose Colored Crystal (October), Topaz Colored Crystal (November), Blue Zircon Colored Crystal (December), Light Rose Colored Crystal, and Light Sapphire Colored Crystal.